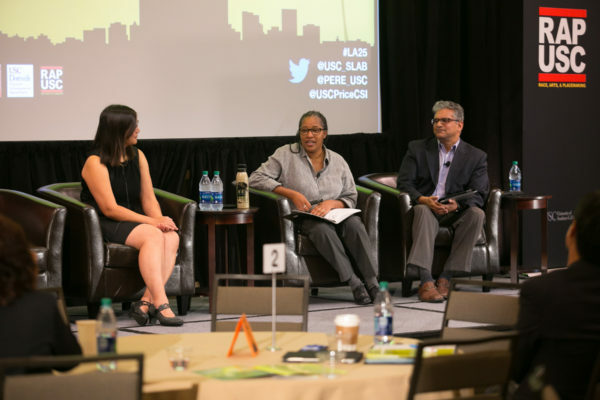 Our conference, Race, Arts, and Inclusive Placemaking after the 1992 Civil Unrest, takes stock at the 25th anniversary of the 1992 LA Civil Unrest, a seminal moment which sparked a national discussion about the conflicts in our cities. 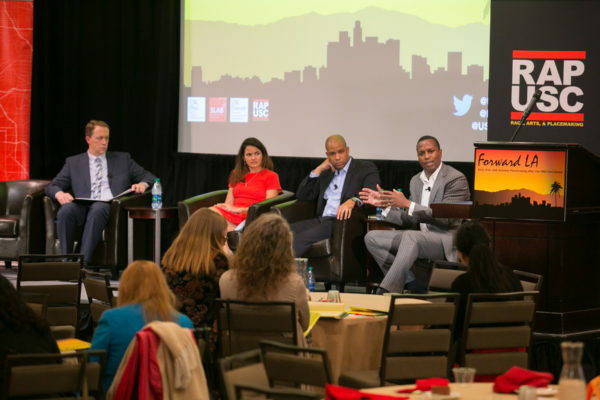 Since then, Los Angeles has been rebuilding itself in important ways that are timely to add to the nation’s current discussion about racial injustice, freedom, and opportunity in the city. 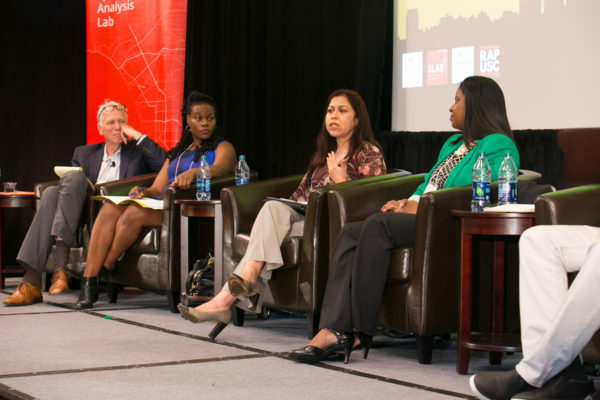 We bring together academics, activists, community members, and artists to share rich data-driven stories of neighborhood change, of catalytic alliances between social movement organizations, and the role that arts and culture have played in transforming LA’s built environment and inter-cultural understanding. We also grapple with the new permutations of persistent urban challenges such as development without displacement, police-community trust, and building relationships between generations of movements, organizations, and communities. 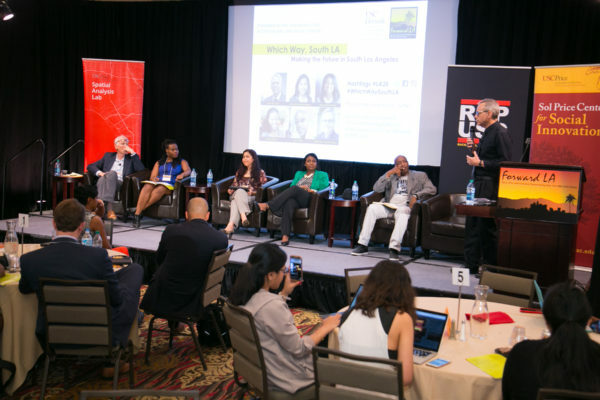 The first day of the conference will explore the ways in which demographics, data, social innovation, and local economic opportunity are shaping unique challenges and opportunities within Los Angeles communities. 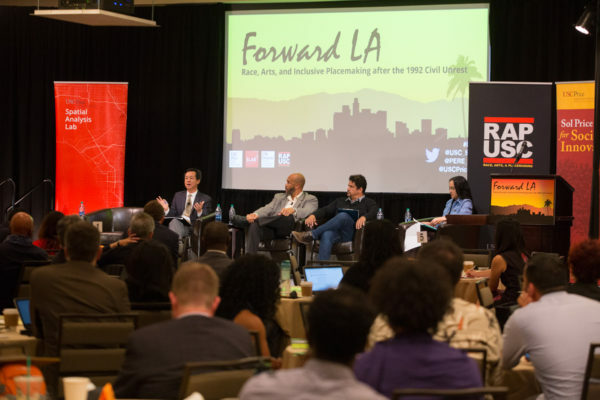 The second day will focus on the ways that innovative Angelenos’ arts and culture practices have helped to rebuild redemptive spaces in LA through food, arts, cinema, media, music, and performance. Special features include the Sunshine & Central photo exhibit, the Neighborhood Data for Social Change platform, and an LA Oral History Booth. Sunshine & Central is an ongoing exploration of the circumstances and hopeful expectations of young people in South Los Angeles. A collaboration between historian Daniel Walker and photographer Matt Gainer, this project engages dozens of millennials from across South Los Angeles to render the face of hopeful ambition and day-to-day reality in one of America’s most complex urban areas. 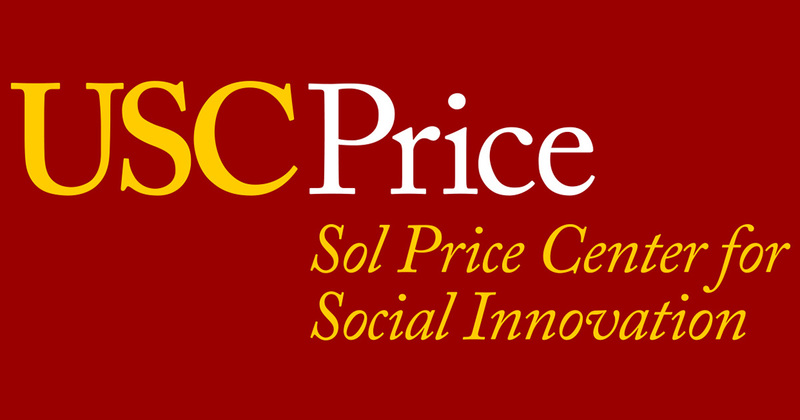 The Price Center for Social Innovation will demonstrate its newly launched Neighborhood Data for Social Change (NDSC) platform, a user-friendly online data resource that allows nonprofit organizations, advocacy groups, and government agencies to access reliable, aggregated data at the neighborhood level. 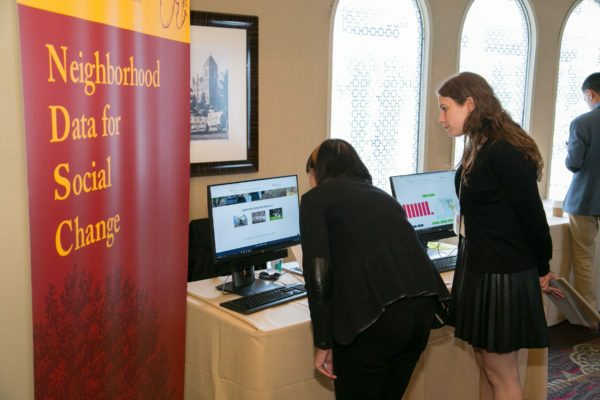 Housing data from ten different policy domains, the NDSC platform addresses the scarcity of local data in many communities across the greater Los Angeles region. The platform pairs data with narrative-based explanations and visualization tools, such as data analysis, digital mapping, and report creation. These narrative and visual components set the NDSC platform apart from other data repositories, making the tool widely accessible and user friendly for all levels of data literacy. The platform, which is open to the public, will empower local governments, nonprofit organizations, and the broader public to better incorporate data into their local programs, helping them develop evidence-based policy solutions to address the most urgent challenges facing their communities. Click here to view the highlights. Demographic change has been a narrative in the City of Los Angeles since its inception as a settlement in colonial New Spain in 1781. These population shifts continue to mold and shape the neighborhoods and cultural life of the region. This panel will discuss some of the demographic changes in the decades leading up to 1992, transitions since then, and how we might expect Los Angeles’ neighborhoods to evolve in the next 25 years. While recent research has documented the benefits of living in low-poverty neighborhoods (see the Chetty et al research on Moving to Opportunity as an example), there remains much debate about what are the mechanisms that help families thrive. Measures of neighborhood opportunity are commonly focused on a school’s test scores, the average education or income of the area, but these measures are often connected to high cost of living areas and may miss important predictors of success such as social cohesion, access to civic resources and other important factors. This session will discuss how to measure opportunity neighborhoods and how policies can be developed to ensure that no neighborhood is devoid of the necessary characteristics for all families to thrive. Health disparities across income strata and race and ethnicity have been well recognized in the literature. Residents of high poverty neighborhoods often face multiple disadvantages that impact their health. Unfortunately, health data are often not available in a disaggregated fashion to allow community actors to target and develop interventions in neighborhoods. The advent of the 500 Cities project (https://www.cdc.gov/500cities/) provides an opportunity to obtain data on a variety of health outcomes at the Census tract level. This panel will answer questions concerning what neighborhood data will allow community stakeholders to do as well as discuss the challenges that exist in reducing health disparities in low income communities. While data continues to become available at an increasing rate, there remain challenges to leveraging these data to facilitate regional wide assessments of social innovation. Some of the current challenges include a lack of current and consistent data, as well as the ability to demonstrate the relationships between various data sets, i.e. neighborhood crime and suspension rates within a particular school system, or neighborhood foreclosure rates and childhood obesity levels. This session will discuss what is necessary for data to become an intervention that facilitates neighborhood change, and how community actors can use these data to achieve collective objectives. In 1992, South LA (and many parts of the rest of Los Angeles) exploded in a wave of civil unrest. The proximate trigger was a startling verdict in a case of police brutality but the fundamental causes were rooted in a toxic mix of neighborhood disinvestment, economic despair, over- policing, unhealthy land uses, as well as a series of other factors. South LA finds itself today still grappling with that legacy of economic neglect and mass incarceration but also facing a new set of challenges as well, including threats of gentrification and displacement and the need to successfully incorporate a large immigrant presence. 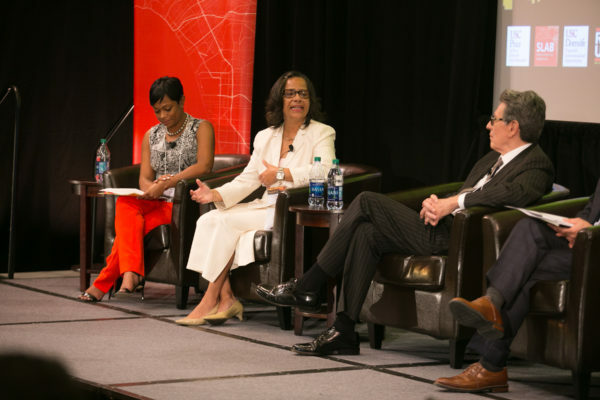 At the same time, the area has shown tremendous resilience: It has gone through one of the most dramatic demographic transitions in urban America, sometimes with tension but often with grace, and it has cultivated a generation of leaders who are developing a shared vision for socially just and economically prosperous region. This panel will be a moderated discussion about the root causes of on-going struggles that pre-date the uprising and community-led efforts to improve conditions over the past 25 years with a focus on the grassroots organizing, power-building approaches, and strategic campaigns. 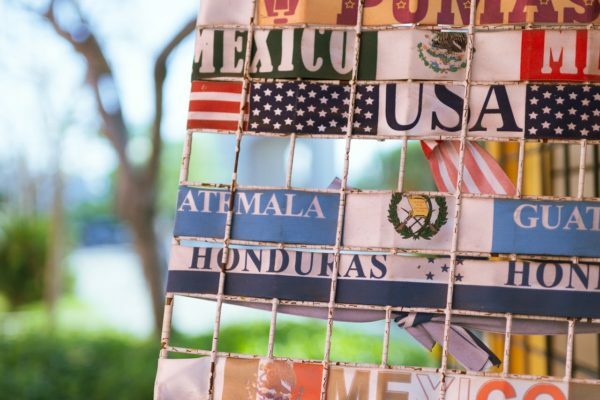 This session brings together artists and organizations who have been working to break down LA’s segregated art geography by where they situate themselves in the city, their connections to insider and outsider arts, and practices to engage local communities and the larger public. We will also discuss the challenge of how art can raise a community’s self-value without igniting displacement and gentrification. 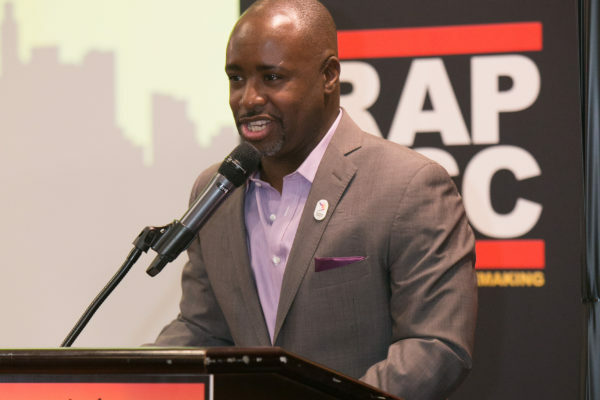 In 1992, food disparities were already on the South Los Angeles reform agenda, but in the 25 years since, food equity has become a central element of a broader food equity movement. This panel examines two aspects of this movement: first, how have community-based organizations created change through new community gardens, farmer’s markets, and healthier food supply, and two, what has been the role of food in the evolution of USC and its community relationships? 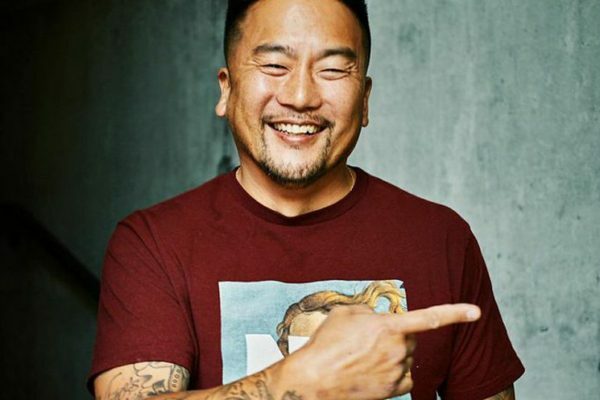 Calling itself a “fast food revolution”, Locol restaurant in Watts offers a business model for producing healthy, affordable, chef-created food that employs and serves the local community. 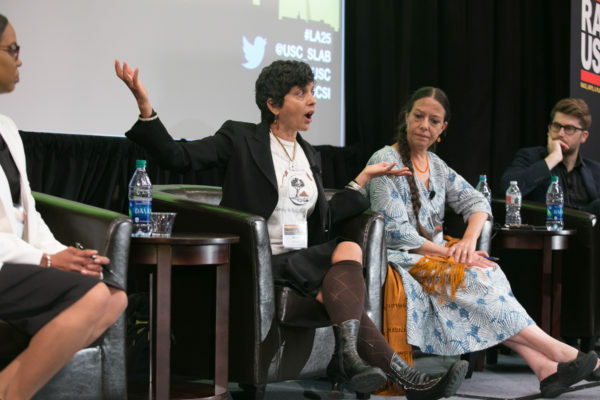 These film and media content creators of color share the creative strategies they have had to employ to have their vision and voices heard. 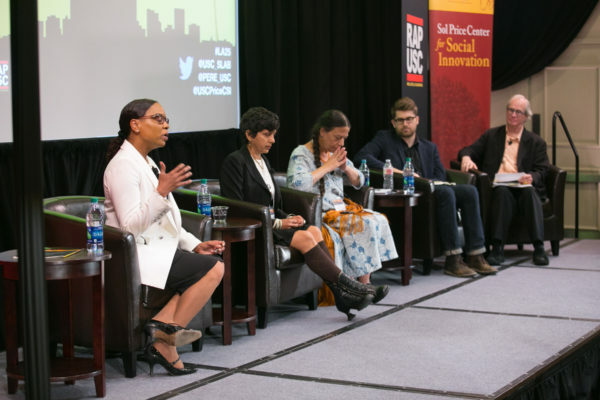 Their projects offer counter-narratives to racialized mainstream news and entertainment and search for ways to connect to social action. Starting with a viewing of Kendrick Lamar’s Alright video, the panel deliberates the racialized body in the city and the power of visuals and music in processes of civic engagement and building stories of resistance. 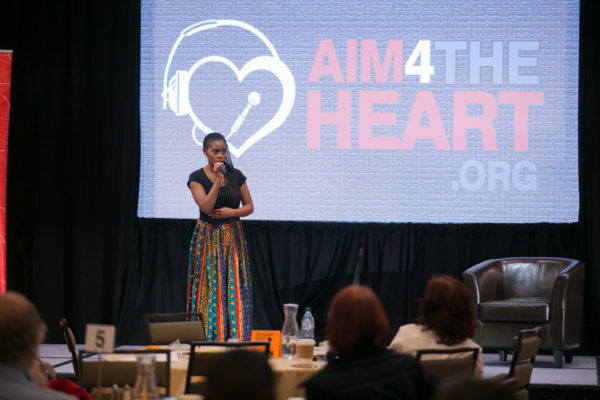 For over three decades Mic Sessions and Aim4theHeart.org (AIM) has utilized arts as a vehicle to teach emotional literacy. This work continues to transform the hearts and minds of at-risk youth. Founder Leila Steinberg (whose work helped shaped the legendary artist Tupac Shakur) along with Law Professor Jody Armour and AIM”S artists will present a one hour introduction to AIM’s work.